Throughout your adventure in Ashina there are a few names that will continue to pop up. One of these, which first appears early on, is shrouded in mystery. 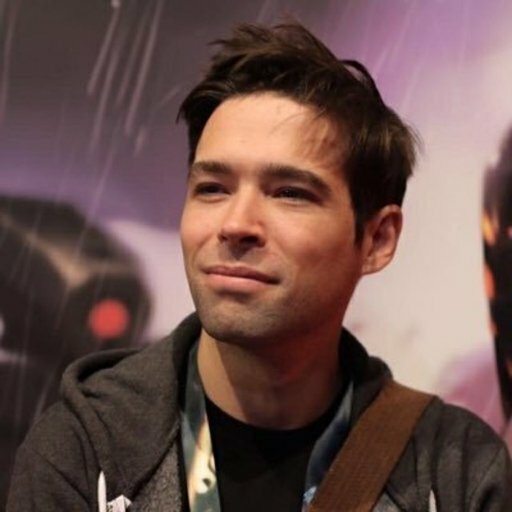 You’ll find references to Dogen in a few important item descriptions, including the Healing Gourd, but who is this man and why is he so important to the world of Sekiro: Shadows Die Twice? Spoilers ahead! 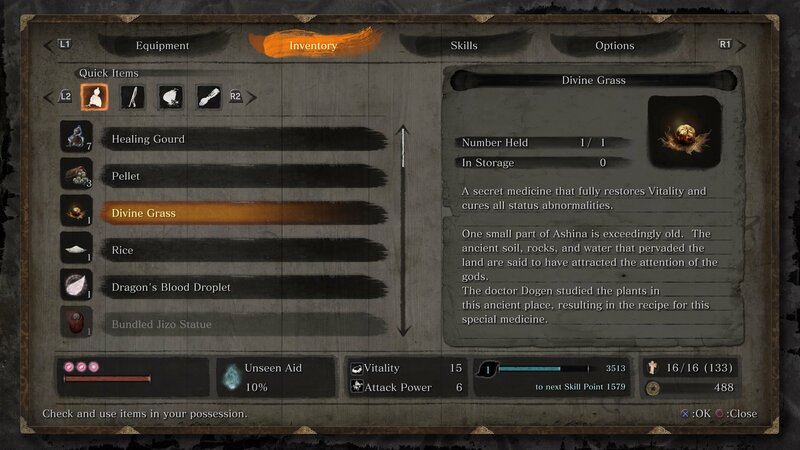 The first mention of Dogen comes from an item received from The Divine Heir in Ashina Reservoir at the very start of the game. The Healing Gourd was created by a disciple of Dogen’s, and it’s here we start to get a glimpse into what a genius the man was. A gourd filled with Vitality-restoring medicine. Resting refills the Gourd. Made by an apprentice of the extraordinary doctor, Dogen. Though it is strange that the gourd's medicinal waters refill automatically, the seeds within may hold the secret to how it works. The apprentice mentioned in this item description is none other than Emma, who hangs out with the Sculptor at the Dilapidated Temple. She invented the Healing Gourd and it’s she who upgrades it whenever you bring her another Gourd Seed. Emma learnt her mastery over the magical medicine within the gourd under the tutelage of Dogen. A reasonably rare item, the Divine Grass, tells us just how strong Dogen’s medicinal powers were. This item fully restores Wolf’s vitality and cures all status ailments. It is the ultimate curative medicine. A secret medicine that fully restores Vitality and cures all status abnormalities. One small part of Ashina is exceedingly old. The ancient soil, rocks, and water that pervaded the land are said to have attracted the attention of the gods. The doctor Dogen studied the plants in this ancient place, resulting in the recipe for this special medicine. Dogen taught his disciples to heal the people of Ashina, which could sometimes include shinobi. We find this out when we offer Emma some Ashina Sake (though not the bottle that she gives to us for the Sculptor). A curious memory that speaks little of Dogen, though does raise questions around Wolf himself. “None of this sounds familiar to you?” she asks him. Later we discover that Dogen more than just Emma’s master, but that he actually adopted Emma as a young girl. Giving the Sculptor the Ashina Sake, given to you by Emma, he begins to open up about that period. It’s here we discover that the prosthetic arm, given to Wolf by the Sculptor early in the game, was created by Dogen himself. Not only that, but he created at least one of the materials needed to create your prosthetic tools. 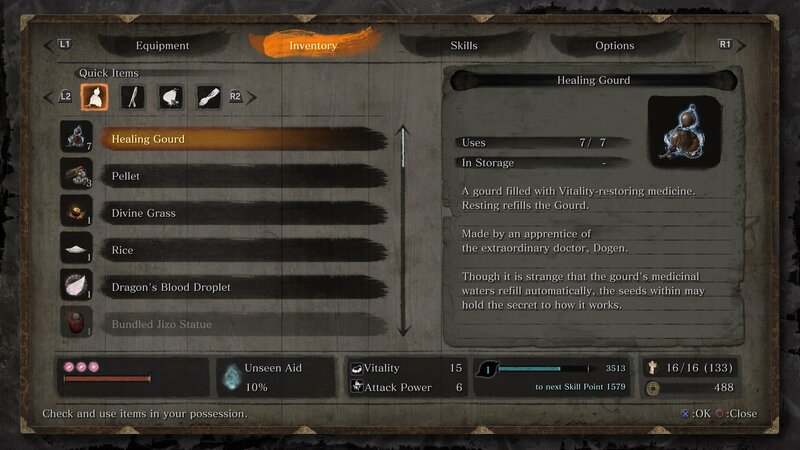 The Shuriken Wheel is found near the Ashina Outskirts Wall - Gate Path idol and is likely the first of the prosthetic tool materials you’ll find in the game. A mechanical device made by the mechanical genius Dogen. Can be fit into the Shinobi Prosthetic to become a working Prosthetic Tool. While it is palm-sized, a surprising number of shuriken can fit into the Shurkin Wheel, as the edges were designed for stacking. A fine example of what can be achieved when one matches mechanical finesse with a Shinobi's talent. 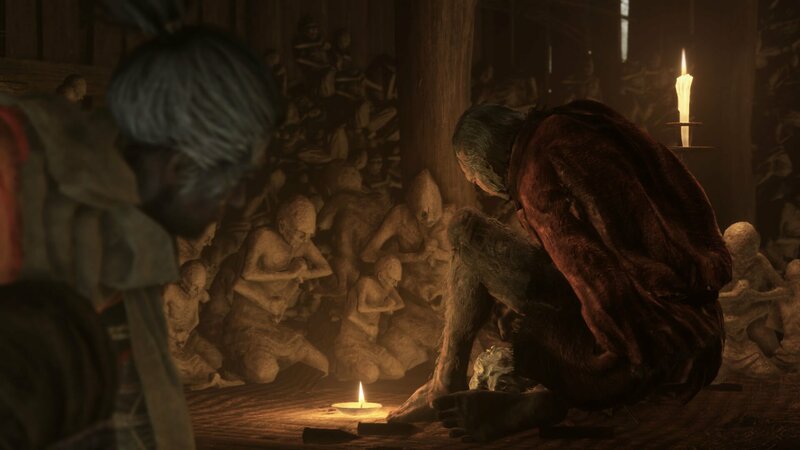 The Sculptor has more to say about Dogen, specifically about his obsession with technology and the creation of the prosthetic arm, after you’ve given him the Ashina Sake. “The first version was a complete failure, didn't work at all,” the Sculptor explains. “So he remade it. Then he remade it again, and again, countless times. (Chuckles) He told me I needed to practice with the prosthetic in order to use it properly. So Emma would pester me into carving her spinning tops and other toys. After much… training... of that sort, it came to be called a Shinobi Fang. Dogen’s importance begins to become apparent. Not only has he “saved your life” by inventing the Shinobi Fang, which has been bequeathed to you via the Sculptor, but you carry with you the man’s legacy. In a way, Dogen is now part of Wolf. Which is a bit of a touchy subject for our friend the Sculptor, who was a close friend of Dogen’s. He was taught to upgrade the prosthetic arm by the master engineer and, we suppose, he must have a good reason to give it to Wolf rather than keeping it for himself. We know the Sculptor was once a shinobi and that he gave it up around the time the rebellions began across Ashina. Hiding away in the Dilapidated Temple with Emma clearly shows he has no need of the device anymore. Dogen’s legacy continues with the Wolf. My disciples have abandoned me for Dogen. they all left me for that hypocritical quack. Even if I die, the research must continue. Finish the procedure, for Ashina's sake! Dogen gained the disciples of the bloody surgeon, most likely because they no longer desired to perform such gruesome work with the doctor. What happened between then and his disappearance, none can say. Though it’s possible Dosaku is involved. Dogen’s whereabouts remain a mystery. Neither the Sculptor or Emma speak of his disappearance. 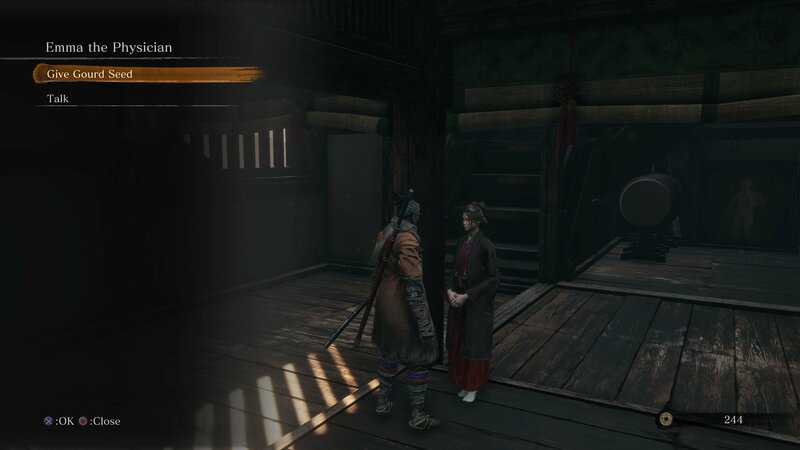 It’s likely, considering the prominence of the character within the story, that DLC for Sekiro: Shadow’s Die Twice could reveal more about the location of the mechanical and medical genius. It feels like there’s plenty to uncover here.